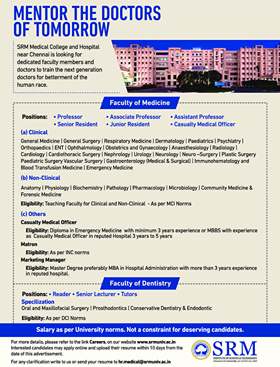 SRM Medical College, Chennai has advertised in THE HINDU newspaper for the recruitment of Professor/Associate Professor/Assistant Professor jobs vacancies. Interested and eligible job aspirants are requested to apply with in 10 days. Check out further more details below. About College: SRM Medical College Hospital and Research Centre (SRM MCHRC) offers a plethora of opportunities to climb the career ladder as well as to change this world to better healthier providing the sophisticated treatment. With an annual intake of 150 students, the medical college commenced in 2005. The facility of collaborative research in SRM Medical College and Hospital Campus is the focal point availing to the proximity to other institutions at the University.